Eric Beard demonstrates a simple corrective exercise for thoracic spine disassociation in clients working on increased mobility. 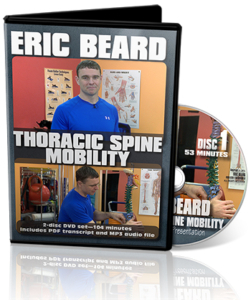 Once we’ve created some extensibility in the soft tissue and some mobility within the joints, we have to teach our clients to be able to disassociate the thoracic spine from all of these other wonderful moving parts. What we’re going to do here is we’re going to do some glenohumeral joint flexion and upward rotation of the scapula. Remember, Marianna had a hard time with this, raising the left arm up overhead, but she’s going to assist herself with some upward rotation. This is something you can manually do for your clients or you can teach them to do on their own. I’m going to have her demonstrate working on it on her own. She’s going to hold for about two or three seconds at the top. We don’t want any pinching or discomfort in the joint. Go ahead and lower back down. If the scapula is restricted, not rotating upwardly, she’s assisting and provided the extra little few degrees of motion through the top. It’s clearing some space in the shoulder. You can see she’s getting closer to the 180 degrees of glenohumeral joint flexion, which she was missing before. Let’s get one more repetition. We’d like to see at least one set of this, maybe six to eight repetitions, just to get that shoulder moving how it should be. I like this at the end after we’ve done the assisted work, lower the right arm down and don’t assist. Let’s get one active range of motion on your own. Let’s come a little bit closer toward the midline of the body right through there . . . up as much as you can and then lower down. We’re teaching our clients to move at the thoracic spine or maintain stability in the thoracic spine where we move at the glenohumeral joint and the scapulothoracic joint. We’re going to get progressively complex in these movements, so we can have subtle articulations in the thoracic spine without accessory compensation in the shoulders.